Stout appreciation continues with the Funk Estate Afrogato. A desert beer 🙂 for which then pudding stout, pudding down a track, pudding up the numbers and pudding is served. As you know, we love our imperial stouts here at Funk Estate, and this one is no exception. Afrogato is inspired by what is arguably the best, biggest and booziest dessert to exist: Affogato with a generous dash of amaretto. 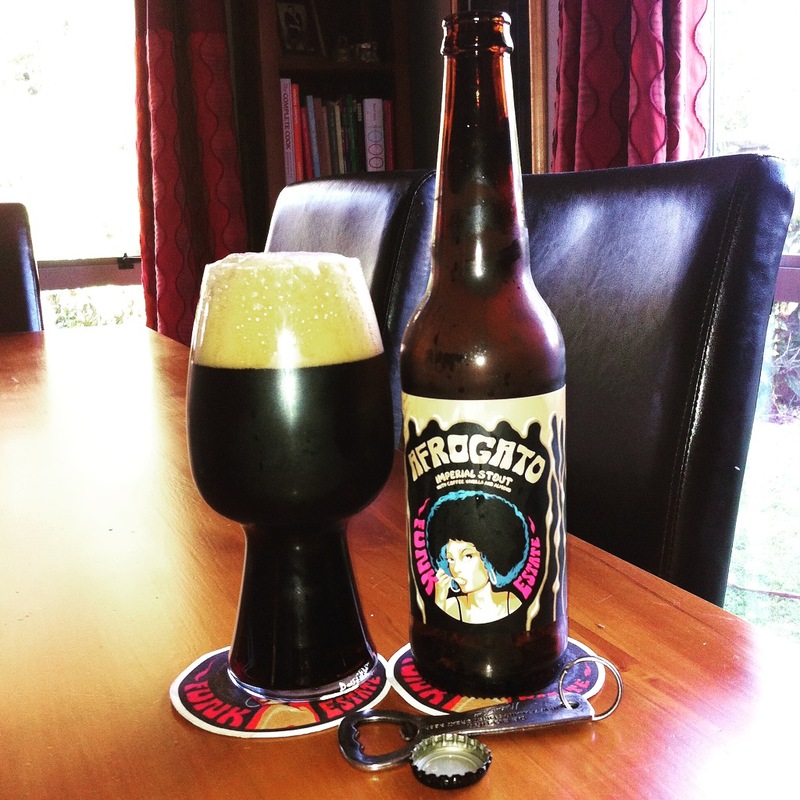 Afrogato is a creamy and silky smooth imperial milk stout, with freshly ground coffee, vanilla and a touch of almond. Dayum. On opening there is a chocolate burst, and one other thing that passed me by, but was quite dry. What a brilliant pour of a thick black beer with the biggest mocha chocolate head. Banging amounts of aroma, coffee mostly vanilla. Heck that is just gorgeous to drink. Sweetness in layers, bitterness than a slightly dry finish. This has so much favour, Lots of coffee, and I get the vanilla, it is very sweet, which I don’t find at all off-putting. Thankfully that giant head dropped a little leaving a glass with magnificent lacing. I’m really enjoying this beer, and have a huge smile as I wasn’t expecting so much goodness, they’ve really gone and done one here. The pdubyah-o-meter rates this as 9 of its things from the thing. I can see why people really like this, it appeals as a story, but it delivers in the tastes that it says it has, coffee and vanilla. It has a nice aroma, and it looks really good in the glass. If you’re not paying attention to the alcohol level it could lead to an early night. Lucky for me I’m not setting fire to things tonight to entertain, so I can just sit here and ponder. Am I enjoying it? I really genuinely am. Would I have another? I really would, if only I’d known I would have got two, is two puddings too much? Would I share with a friend on a porch and set the world to rights? Not everyone likes the idea of dark beer, this though has so much flavour in it that it would be a really good beer to set out the case for stouts. Brilliant. Music for this : Local music time, well in country music, ” The Chills ” ” Silver Bullets” on the Spotify he Chills are a guitar and keyboard-based rock band from Dunedin, New Zealand. Have a go at Warm Waveform. MrsPdubyah without knowing this was current asked me if it was an old album, it really must be proper Dunedin Sound music from the way back when. Nice one Philip. I wish I had some! That beer isn’t even on Funk Estates website. You may have the only one in captivity! 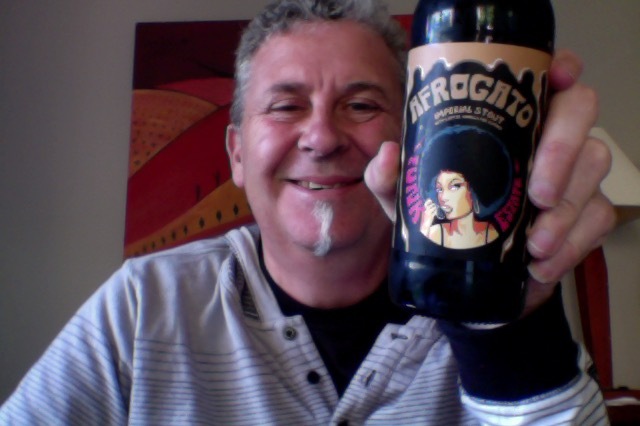 This entry was posted on November 5, 2015 by Philip Walter in Beer, Beer of New Zealand, Beer Review, Craft Beer, Critic, Funk Estate, Imperial Stout, Justsaying and tagged Afrogato, Alcohol by volume, Beer, craft beer, Funk Estate Afrogato, Funk Estate Brewery, Stout.